Home prices in Sequim are so much lower than California home prices, but some of the extreme prices and multiple bids above listed price in California is beyond ridiculous. 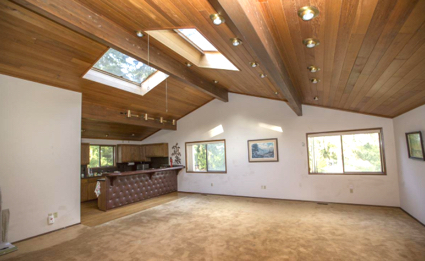 This run down miserable tear down in Palo Alto was listed at $1.75 million. By comparison, I sold this 5,000 square foot home in Sequim for $950,000, and it has an incredible water view of Sequim Bay as well as a beautiful big private yard. 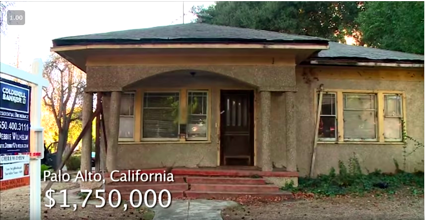 The craziness of the California housing market is well documented in this video entitled, Million Dollar Shack: Trapped in Silicon Valley’s Housing Bubble. This video was produced in 2015, but since then prices have continued to go up and up and up, and many areas are simply unaffordable now. At this point in November of 2018, we are seeing what I think is a plateau in California housing prices, and possibly a market that is about to pull back substantially. That brings us back to Sequim home prices. I recently sold a gorgeous Bell Hill home in Sequim for $702,000, but based on what I know about comparables in California, this home might have sold for $3 million in California, and the home I sold a few weeks ago for $250,000 in Sequim would probably have sold for $2.1 million. It was way better than the home that sold in Palo Alto above for $1.75 million. You can do some comparisons yourself online by using a California MLS site and then using a Sequim MLS site to look at similar homes and home prices. Sequim is not the cheapest place to buy a home, but it is one of the most beautiful areas of the country, and homes are affordable by any comparison. The idea of buying a home sight unseen is most likely not your first choice. Normally, I would not recommend buying a home until you’ve walked through it and around it yourself. But the Sequim real estate market is a strong seller’s market with a very low inventory, and demand far exceeds supply. Buyers from around the United States are watching the Sequim real estate market closely, and this means by the time you arrive in Sequim, the home you saw in the MLS and planned to see is probably sold. I’ve helped nearly a dozen clients purchase homes sight unseen. As a buyer you will have to rely on your buyer’s agent to do everything you would do and a lot more. I just sold a home sight unseen this week to a couple from New York. Here’s how we did it. For months my clients searched the local listings using the best Sequim MLS site, which includes every home for sale in Sequim and Port Angeles and the entire county. I recommend this site because it is much more accurate than Zillow, and in this market, you need accurate information on homes. As my clients planned their trip to Sequim, they saved their favorites. Unfortunately the homes on their short list were all selling before they could get here. It’s hard to find a home plus a Sequim guest house plus a shop only a few miles from downtown Sequim, especially on a beautiful lot in a quiet area with privacy. This is a property I just had to write about, because you will rarely find a property like this in the Sequim area. It’s not perfect, because it needs some work, but if you can either do the work yourself or are willing to hire someone to do it, you will get a one-of-a-kind property at a bargain price. The main home is 2,500 sq.ft. with 3 bedrooms (on the 2nd floor), 2.5 baths, and an attached 2 car garage. This home is vintage 1979, so the kitchen needs a major upgrade and the hardwood floors need to be refinished. I suspect you would replace carpet, too. In addition the roof has a lot of mildew on it, and the back deck is collapsed and needs to be totally replaced. It’s possible the wood shingles on the roof need to be replaced. How did the maintenance get so far behind on this home? The husband passed away years ago, and his widow lived alone for many years until she passed away recently, so this is an estate sale. A nice Sequim guest house is hard to find in this market, and this guest house is very impressive. Unlike the main house that needs upgrading and maintenance, the guest house is move-in ready, and with over 1,000 sq.ft. the huge living room and gorgeous kitchen are more than comfortable for a couple. When you look at the photos, you’ll see how cool this shop is. High ceiling, super bright shop lights, and heating and ventilation equipment. The high shop door also means a motor home would have a warm home. In addition to the shop, there is a large double garage beneath the guest house. And the shop also has a kitchen and a bathroom. 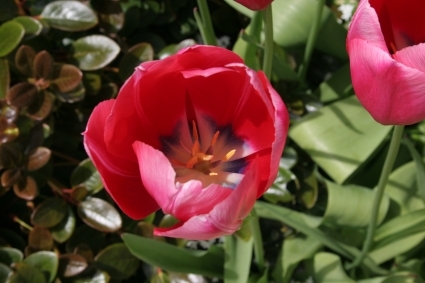 You can look at photos of all of this at Sequim Shop + Sequim Guest House. The listing price is $425,000 for 2 acres plus the main house plus the guest house plus the shop. In my opinion, the guest house and shop alone are worth well over $250,000. If you’re in the market for a spacious home plus a guest house and a shop, maybe you should call me now at 360-775-5424. Our inventory is very low of late, and the right home listed at the right price is selling fairly quickly at full listing price. That doesn’t mean that will happen to this property, but I share that to emphasize that if this is your property, you probably don’t have all the time in the world. Someone is likely to ask me to draft an offer on this property fairly quickly. Looking for a Sequim guest house and a shop? 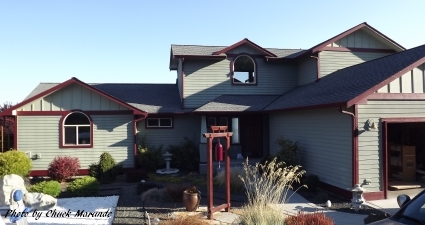 East Sequim Bay is the gorgeous sunny side of Sequim Bay, and this custom home on 5 acres is on a very private property. It’s 4 bedrooms, 3 and a half baths, and 3,377 square feet. In addition to the attached garage, there is a large detached garage/shop. The kitchen boasts cherry cabinetry, quartz counter tops, a breakfast bar, an eat-in dining area, and formal dining. The master bedroom and bath plus a multi-purpose type room and another bath are in the northwest wing. 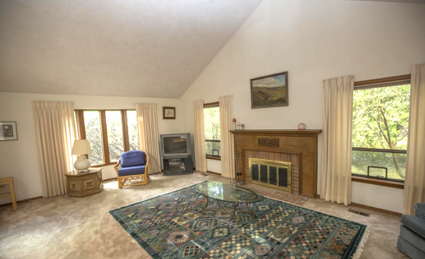 The living room has a propane fireplace with a large bay window overlooking the park-like setting. On the north side of the house, you get a little view of East Sequim Bay through the trees. [See the MLS data at East Sequim Bay.] But you don’t have to guess what this home looks like, because we have a 3 dimensional interactive tour you can take right now. Load the video below and use your mouse or keyboard arrows to walk through the house and up and down the stairs. If you play with this interactive tour, you’ll be able to see the 2D and 3D floor plan, too. 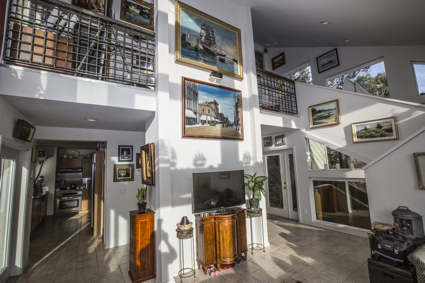 Now you’ve seen a home on East Sequim Bay. If you’d like to see this one in person, give us a call. 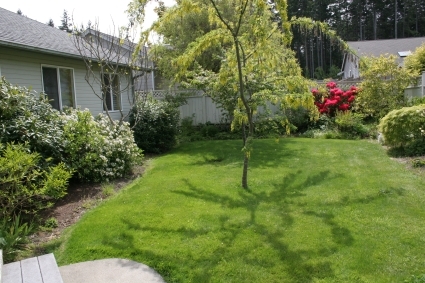 This Sequim home is on acreage, enough for a large garden or apple trees with a lot of room left over. 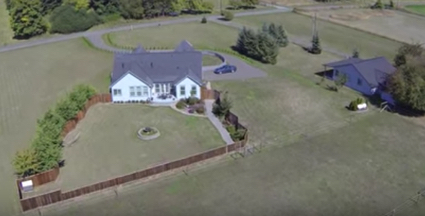 It’s just under one acre, but it’s all useable acreage, largely fenced, and has rich soil. This is a very peaceful location far from the noisy traffic of the highways. 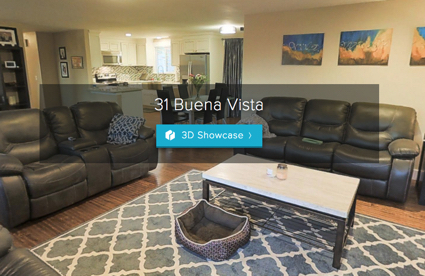 Click on this image to watch a delightful 3D virtual tour, which allows you to walk through the entire house by using your mouse or your keyboard arrows. You can turn 360 degrees from anywhere to look around, just like you might do if you were in the house right now. This is the kind of home in our shrinking inventory that is likely to sell quickly, so I recommend you call me, Chuck Marunde, at 360-775-5424, and let’s go look at it quick, because it will be gone soon. Homes have been selling quickly at full listed prices lately, so there’s no exaggeration on this topic. 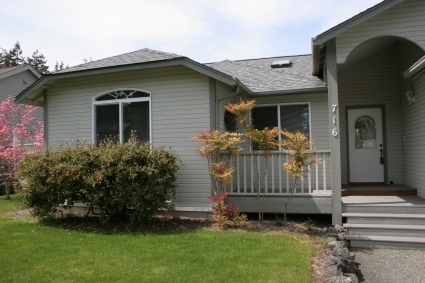 And it is especially hard to find a Sequim home with acreage and such an ideal location. This listing is in the MLS now, but for many of the public MLS sites, it won’t show up until tomorrow. The real estate inventory of active listings in the northwest has reached a crisis point for buyers. Some local brokers in Sequim and Port Angeles are saying that the real estate inventory of nice homes for buyers is at the lowest seen in many years. I talked with a broker from Olympia, Washington yesterday, and he said their real estate inventory is lower than it has been since 2005. The Northwest MLS reports that, “Buyer anxiety is rising as the pace of home sales is faster than brokers are able to replenish inventory.” In Portland and in Seattle, Bellevue, Redmond, and Tacoma the real estate inventory is low, and buyers are having to compete in the Seattle area by bidding above the listing prices. Homes are selling in a matter of days. In Sequim I have buyers who are working extra hard to find that needle in a haystack simply because the real estate inventory is so low. Fortunately in Sequim and Port Angeles, we have not seen a big jump in prices, and bidding is rare. But buyers are having to do much more research online before they come to view homes, and when they find the ideal home, they cannot afford to fool around, because several other qualified buyers are undoubtedly also looking at the same home online. The first to get mutual acceptance with the seller wins. That’s how the shortage in the real estate inventory if affecting buyers. Sequim homes are selling fast as are Port Angeles homes. As I pointed out in an earlier article, home sales are up for July, August, and September of this year over last year by 29%, 66%, and 100%, respectively. But don’t take my word for it. If you are looking at homes online from California, Nevada, Arizona, Texas, or Colorado (or anywhere outside the Sequim and Port Angeles area), you can prove this to yourself. Here’s how buyers find out that homes are selling fast even before they arrive to look at homes. Buyers will use a very powerful online Sequim MLS and Port Angeles MLS search site, and typically they will use this site for several months before they arrive. During the several months of viewing homes online and saving a short list of homes to look at, clients repeatedly discover that one to three homes on their list are sold before they arrive in Sequim. And again the day before we go out to look at the shorter list, I typically discover that one or two of the remaining homes are also sold. Homes Are Selling Fast – A Surprise? It’s really not a big surprise that homes are selling fast. Retirees are all thinking very similarly about two things. First, they are telling me they think home prices are at or near a market bottom, and second, they are also saying they think interest rates are going to be going up fairly soon. The vast majority of retirees moving to Sequim and Port Angeles are feeling that now rather than later is the time to make their move. Some are buying their retirement home one to two years before they expect to move to Sequim. Sequim and Port Angeles is not the only area in the country where the inventory of the best homes is shrinking. There is competition now in making offers, even here, and homes that are reasonably priced to begin with are now selling at full price. Let’s hope we are at the beginning of a real estate recovery with this evidence that homes are selling fast in Sequim and Port Angeles. Did I Pay Too Much for My Sequim Home? “Did I pay too much for my Sequim home in 2007?” This is a question a client asked me today, and since it is relevant to so many Sequim homeowners right now, I think the answer is worthy of posting here. This issue is important to sellers right now, but deep in this story is a huge lesson for buyers. Since I act primarily as a buyer’s agent and never as a dual agent, this article could be the one of the most important articles a buyer will read on this real estate blog. To answer the question of whether you over paid for your Sequim home, we need to look at the history and put your purchase in context. I looked at the recorded Deed and it shows you closed on March X, 2007 at a price of $300,000. That was the tail end of the boom years in real estate prices. The year 2005 had the most sales in Sequim at the highest prices, and 2006 sales slowed down but prices did not begin to stall out until the impact of the real estate recession began to be felt in the spring and summer of 2007. You purchased at the precise end of the bull market in real estate and at the beginning of the decline. But there’s another important aspect of valuing your Sequim home, even going back to when you purchased it. Let’s look briefly at this property’s history. It was built in 1983 at what was probably $55 per square foot or $67,000. Land like this was selling for about $25,000 at that time. With a few other costs, I would estimate that the owners had about $92,00 to $110,000 in this property and home. In November of 1999, they sold it for $142,000. Considering they held the home from 1983 to 1999, or 16 years, they had a very modest profit of roughly $30,000. From 1999 to 2005 Sequim saw the largest price appreciation of homes in our real estate history. As I’ve said already, those prices did not start dropping significantly until 2007. Some home prices dropped slightly in late 2006 and early 2007, but it was later when we began to see the cumulative effect of the nationwide real estate recession. How will this forecast or negative outlook on the national housing market play out in the Sequim real estate market on the Olympic Peninsula? What is the real estate market going to do in the Sequim area in the next 12 months to 36 months? First, the Sequim housing market must be differentiated from the national housing market. I think we could all agree that the real estate market is dramatically different in major cities around the U.S. The Las Vegas market is completely different than the Anchorage market, as the Houston market is different than the Denver market, as the Miami market is different than the San Bernadino market. And Sequim is different than any of those markets. National statistics are useful for some purposes, but not in accurately predicting what will happen in some specific markets like the Sequim housing market. New listing at 1573 Doe Run on Bell Hill in Sequim with a valley view, a mountain view, and a partial water view. Priced to sell quick way below the original listing price. 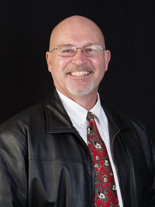 Sequim real estate brought to you by eXp Realty and Chuck Marunde. Sequim is having a spring sale, and Sequim homes are selling. So are Port Angeles homes (represented in these photos). We have clearly had a significant boost in homes sales these past couple of months, and many homes were sold these past two weeks by me and other Realtors. Retirees are making their move now that spring is here and because many feel interest rates are about to start going up gradually and are unlikely to come back down to these historical 30 year lows. This three bedroom, two bath home was built in 1995, and is in nearly perfect condition inside and out. It’s 1,700 square feet is amazingly efficient with an architectural plan that uniquely creates a kitchen and adjoining sitting area with a cozy setting. It has vaulted ceilings, a master bathroom with a shower and a deep bathtub, and a garage with a 12 or 13 foot ceiling. The landscaping is gorgeous around this home even though the home has been vacant. It’s great when a home is well maintained during the listing period. I represented the buyers, and they are very very pleased. Oh, the price? Try $232,000. This is unusual, so don’t get your hopes up that you’ll find a Sequim home just like this. Photos by yours truly. 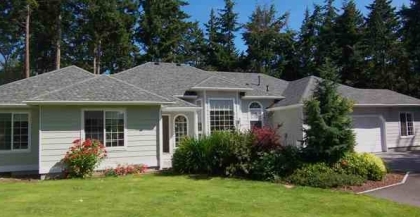 Sequim homes are getting a lot of showings lately. Buyers are arriving from around the country and looking for their retirement home. I wrote about this some months ago, and it happens every spring in Sequim. Of course, all of us were watching carefully to see how this recession would effect the buying market here, and the good news for sellers is that people are still retiring in Sequim from all over the country. I’m very busy working with buyers, all of them from outside the area. One of my listings sold last month, another one of my listings sold last week, and I sold a lot last month and another house this week. All of these buyers are retiring to this area. I also received an offer today (for an amount I cannot disclose at this time) on a listing I have on a custom built home on five acres fenced for horses with a private trail to the beach. What are the price ranges with these sales? $229,000, $395,000, $100,000, and $232,000. The undisclosed sale is just under $399,000. It is apparent that buyers are making their move now in these spring months and not waiting for the economy and the real estate market to prove that the recovery is already here. 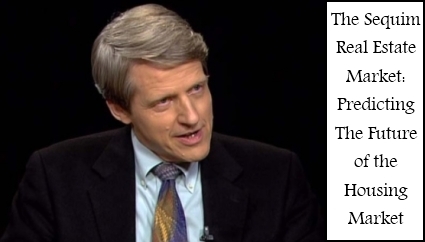 Of course, the self-fulfilling prophesy with the belief that we are in a recovery may itself spur the recovery. 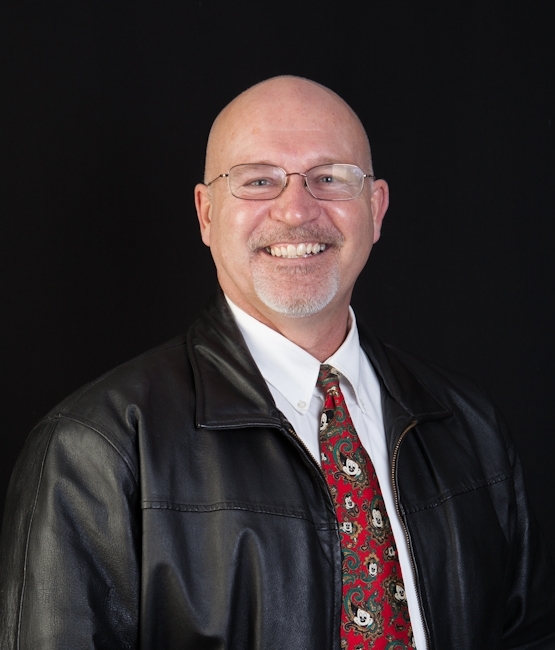 Whatever reasons buyers have for moving to Sequim to buy their retirement homes, I am pleased that so many are choosing to work with me as their Sequim buyer’s agent. I am grateful for the privilege of helping clients with such an important decision. We are in the midst of a buyer’s market. That’s not front page news. What is news is that every single transaction is unique and presents a whole set of challenges that every buyer does not anticipate. I kid you not. After hundreds of transactions, I can testify on behalf of hundreds of buyers that there is almost always some surprise or some twist of events that presents its own challenges. In fact, one can almost guarantee that when you purchase a home in Sequim (or anywhere) that there will be some hurdles that either terminate a transaction or come close to terminating the entire transaction. These challenges are not the exception but the rule. What challenges am I talking about? 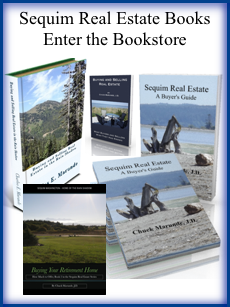 How about some real life examples from Sequim real estate transactions? Sequim Homes for Sale: Listing Prices High or Low? There are many Sequim homes for sale and nearly all of them are listed with a Realtor in the MLS. There are a few homes on the market that are FSBOs (for sale by owners), but these are not in the Olympic Listing Service (our local MLS), so they don’t get the broad promotion on the Internet. Most buyers are not even finding the FSBOs, and probably 98% of buyers are looking on real estate agent sites to search the MLS (or affiliate sites where the listings show up). So my question is focused on listed properties. Are Sequim homes for sale that are listed in the MLS too high or too low? My answer won’t surprise anyone who has been looking in our MLS and comparing homes and prices. Some listings are over priced, and some listings are listed at a very reasonable price. I’ll explain. I’ve shown some houses to out-of-state buyers that both my client and I thought were over priced, and some were perhaps $90,000 to as much as $200,000 over priced. Now this isn’t a mathematical science, so no onc prove that a home is over or under priced by a precise dollar amount. But what we can do is compare a home to dozens of other similar homes, and the average buyer gets a pretty darn good feel as to whether a home is priced fairly in this market. On the other hand, there are many homes listed that are currently listed at very reasonable prices, even in this real estate recession. I have a home listed on Bell Hill right now that is getting a tremendous amount of attention, and it is because it is priced so reasonable. [See Sequim Bell Hill Home for Sale] Of course, Bell Hill in Sequim is a popular area, and many of the homes have gorgeous water or mountain or valley views, and so if a nice home is priced right on Bell Hill, it is going to get some attention. The Sequim real estate market is not perfectly balanced when it comes to pricing. Some homes are listed at low prices and some are listed at high prices. Your mission, should you choose to accept it, is to find your ideal home and negotiate to get it at a price you know is a great price. 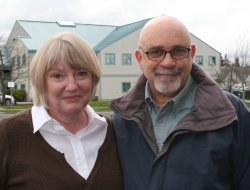 Buying Sequim homes for retirees can be a challenge. Real estate from east of Sequim to west of Port Angeles offers quite a variety of homes and land. The challenge that many buyers have is in deciding what they want. Not knowing can create confusion and frustration in the process. Knowing generally what the ideal property would look like will simply life immensely. For example, knowing what specific parameters to put into an online search for an online Sequim MLS search will give you a list of potential properties to look at. If your parameters are too broad, you will be overwhelmed with possibilities. 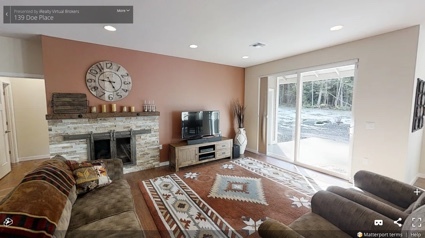 Even after knowing and doing this kind of search, you still can’t tell from simply viewing the online photos and data on Sequim homes whether this is something that you would really like until you see it. But when you arrive in Sequim you can’t be looking at a hundred homes. There isn’t enough time. This is where a professional buyer’s agent can email with you to answer questions and talk to you on the phone so you can narrow down your prospective list of homes or land. Another Sequim custom home sold by yours truly. Perhaps the emphasis is better placed with this phrase, “Buyers cherry pick another Sequim custom home.” I’ve written elsewhere about how buyers are coming to Sequim to find the perfect retirement home in a great location and at a really good listing price (leaving room for negotiating), and they are Cherry Picking the Best Sequim Homes for Sale. I see the reality of this cherry picking again and again. In another article I explained it this way. Buyers are cherry picking the best houses in the best neighborhoods at the best prices. This makes 90% of the existing inventory irrelevant or not part of most Buyers’ universe of potential homes. Since the cherry picked homes are not part of the 90% of remaining homes for sale in the MLS, the available inventory that is suitable for a particular buyer is really quite small, perhaps only 10% of the actual inventory. 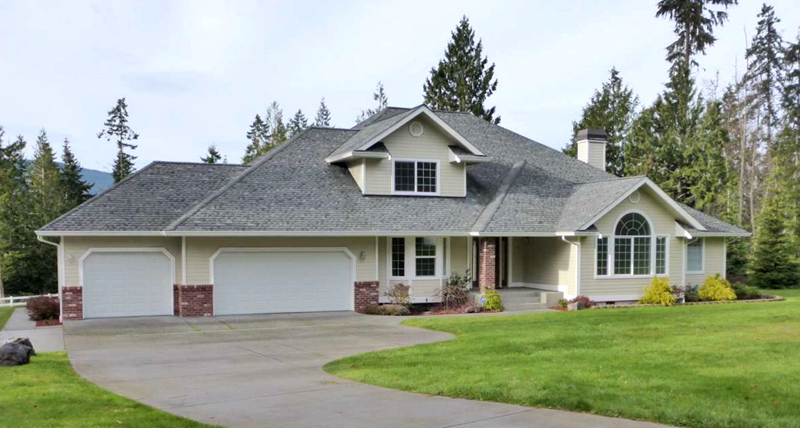 In Clallam County, we have about 800 single family residences in the MLS for sale. If I am right about this cherry picking process that is going on right now, that would mean there are probably only 80 homes that might actually be suitable for you. But then we both know that you would narrow that list of 80 homes down very quickly, because that includes all homes at all prices in all neighborhoods. So by the time we filter that list of 80 homes based on your parameters, that will leave something like 20 homes on the market that might be suitable for you. How long do you think those 20 homes will last when all other buyers like you are doing the same thing you are doing–cherry picking the best homes in the best neighborhoods at the best prices? 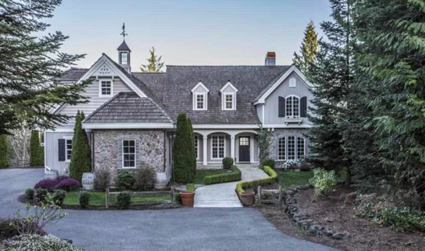 Imagine a private setting just outside the Sequim city limits on three gorgeous acres. Then add a 2,100 square foot, 3 bedroom, 2 bath custom built home with genuine hardwood floors, high ceilings, tiled kitchen and bathrooms, away from traffic and noise, and listed about $100,000 below its replacement value at today’s low prices. This home was just cherry picked off the market by a wonderful retired couple from Salem, Oregon. Above is a photo of this incredible find, and my clients are very fortunate to have found it before it crosses the radar of other buyers arriving here in the busy spring months starting in March. There simply are not very many homes like this in this small market. That’s why I refer to “cherry picking” homes in Sequim. By the way, there is much more to this home than this photo or my brief description. There is also another house on the property, a 650 square foot guest home that matches the quality and appearance of the main home, and it also has a garage. The driveway is all asphalt, too. All I can say is my clients have stolen one of the finest homes at an incredible price. How much did it sell for? Well, let me just say this. The listing price was $397,500. My clients bought it for less, and it would have been a bargain at the listing price. Today’s replacement cost (land, excavation, electric, well, septic, driveway, main house plus guest house) would be approximately $519,000. You can search the most powerful MLS online website for your retirement home right now at Sequim Homes For Sale.